In our eyes, and in our kids' eyes, uncles truly rock. Thank you uncles everywhere, for being such important members of our family, for loving our kids, for helping to take care of them and for teaching our children so many things. Our kids look up to you and love having you around. We love you and we appreciate you more than you will ever know. You make our lives more fun, messy, silly and adventurous. And our kids are better for it. Thank you. While aunts, especially child-free aunties usually get the top billing and the most praise, let's not forget how wonderful and fun uncles can be and how much they help to enrich the lives of our kids. Just as fathers are more helpful and involved than ever, so are many uncles. Looking back, a lot of us had cool, fun uncles that we looked up to when we were growing up. They had cool cars, travelled, were up on the latest music and movies, played games with us, let us stay up late and always had fun stories to tell. 1. They love your kids: Through good times and bad times, uncles are there to help encourage, support and love your kids. Uncles don't judge. They don't scold. They don't care about manners, marks or messy rooms. They see and love your kids just as they are. 2. They make your kids laugh: From jokes to games, uncles bring out the silly side of your kids. They make your kids laugh, smile and squeal in delight. Your kids' eyes light up when their uncle walks in the room because uncles represent fun and good times. 3. They really care about your kids: It is important for kids to know that outside of their immediate family, there are other adults who care about them and have their backs in life. If mom and dad are running late, uncle can pick them up at daycare. When they look to the stands at the hockey arena, uncle is there cheering them on. And let's not forget about their awesome bear hugs. 4. They are always there for the fun times: Hockey games, Xbox tournaments, trips to the movies, you name it, they are there! When your kids spend time with their uncle -- it is all about fun, games, and roughhousing. 5. They relish reliving their childhoods: What uncle doesn't enjoy playing with Lego, train sets, action figures, water balloons, playing catch, building forts or introducing your kids to classic movies from the '80s? You can say uncles are like big kids, but is that a bad thing? Your kids don't think so. My son with his uncle Tyler. My kids are lucky to have four uncles. 6. 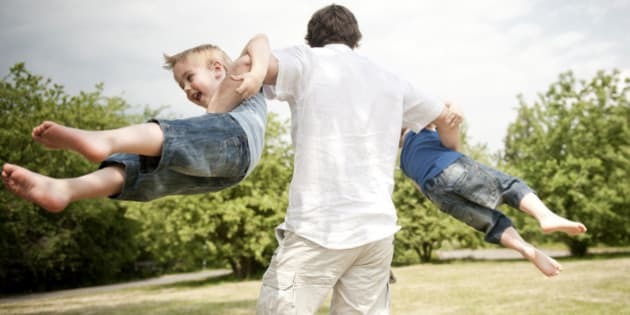 They are less anxious than parents: Tossing kids up in the air? Absolutely! Going for a bike ride off the beaten path? Why not? Going down a slide head first? Yes! Dive into a pool or cannonball? Cannonball, always. While most parents are pretty risk adverse when it comes to their kids, uncles expose kids to carefree fun and adventure and show them that it is OK to take chances. Note: Watching said activities might stress us out, but your kids love it. 7. They can MacGyver anything, anytime: They can quickly solve any problem in a creative and resourceful fashion using only bubble gum, a paper clip and duct tape. 8. They take Star Wars as seriously as your kids do: While I might not know whether Stormtroopers are the good guys or the bad guys, uncles know the answer to every little piece of Star Wars trivia and are always up for lightsaber battles. 9. They believe "more is more" where treats are concerned: Heaping bowls of popcorn, a second helping of ice cream, another slice of pizza. Uncles aren't keeping track. 10. They don't care about screen time restrictions: When kids are enjoying movies or video games with their uncle, all that matters is having fun and trying to beat their last score. 11. They are great to go to amusement parks with: While parents may not want to wait in line for that new ride. Uncle will. And he will go on the ride a second or third time if your kids want. Uncles also won't ration cotton candy intake or discourage your kids from bringing home that giant stuffed tiger. 12. They buy the best gifts: Unlike aunts, uncles don't care what people think or how much it costs or how "fair" it is. Parents might not rush out to buy nerf guns, loud fire trucks or games with 1,000 pieces, but uncles will. Uncles, we love you and we appreciate you more than you will ever know. You make our lives more fun, messy, silly and adventurous. And our kids are better for it. Thank you. 13. They help teach your kids: Uncles have a wealth of knowledge to share and are eager to teach your kids how to throw a baseball, play dodgeball, how to use licorice as a straw, how to ski, how to set up a tent, how to untangle a fishing line and how to use a whoopee cushion etc. 14. Parents can also learn from them: Uncles show us how to be spontaneous and show our silly side more often. When uncles see their nieces and nephews, they are present and focused on fun. No distractions, just energy and enthusiasm that we parents aren't always able to muster. 15. They give parents a break:What parent doesn't love a few minutes of quiet and calm when fun uncle comes to visit? Uncles distract the kids, help to get their sillies out and often take the kids outside to play. Peace at last! Or at least for a little bit. In our eyes, and in our kids' eyes, uncles truly rock! Thank you uncles everywhere, for being such important members of our family, for loving our kids, for helping to take care of them and for teaching our children so many things. Our kids look up to you and love having you around. Uncles, we love you and we appreciate you more than you will ever know. You make our lives more fun, messy, silly and adventurous. And our kids are better for it.